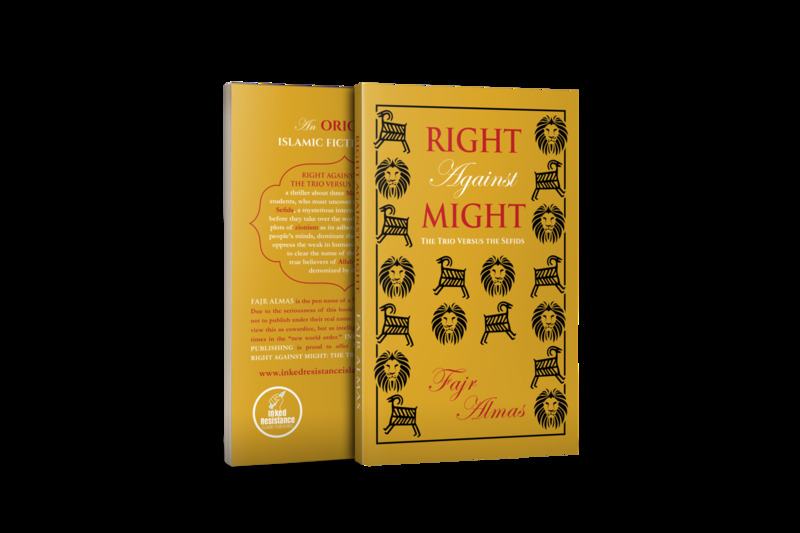 Inked Resistance Islamic Publishing is proud to offer this exciting book of right against might. “We are known as the humiliated and wretched,” Waters began, clearing his throat. “That is fine! Let them think of the Sefids like that. For all they know, the Sefids are a distant memory. No longer are there Sefids to disobey and transgress and kill the Prophets, they believe. Good! Shouts of “Long live the Sefids!” and “Born to rule! Rule to crush!” rocked the Cave. So begins the introduction to the dreaded Sefids, a mysterious international organization, in Fajr Almas’s first novel, Right Against Might: The Trio Versus the Sefids. Product Dimensions: 8.5" x 5.5"
Fajr Almas is the pen name of a North American Muslim writer. Due to the seriousness of this book’s topic, the author has chosen not to publish under their real name. It is hoped that readers do not view this as cowardice, but as intelligence in the face of dangerous times in the old “new world order” and trumpism.